Once again, I’m pretty certain that this comic book first belonged to my brother Ken. At this point in my comic book evolution, while I didn’t yet know who editor Murray Boltinoff was, I understood that WORLD’S FINEST COMICS along with BRAVE AND THE BOLD and SUPERBOY AND THE LEGION OF SUPER-HEROES were “wrong” somehow–that they didn’t follow the rules the same way the other DC super hero comic books did. And as those comics were the ones I preferred, it was always a dodgy proposition to pick up one of these suspect titles–you never knew quite what you were going to get, or how it would strain the disbelief of even a nine-year-old, such as I was. 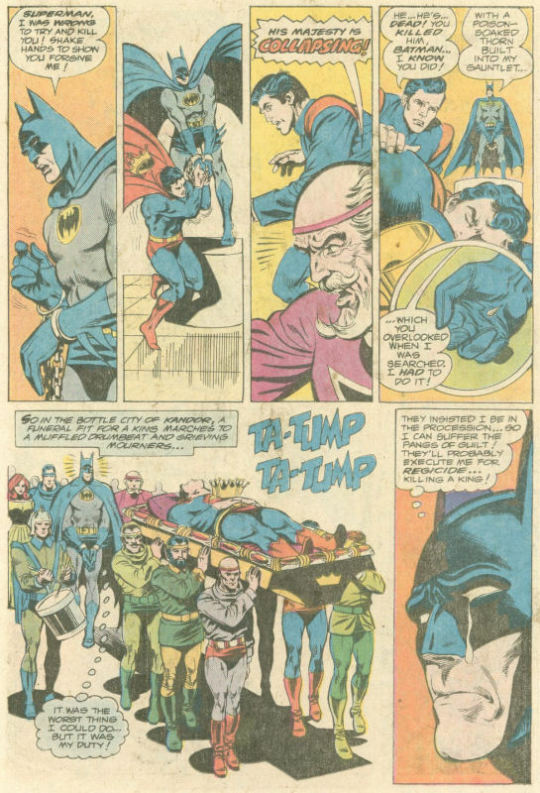 The story was written by Bob Haney, a skilled craftsman and one of editor Boltinoff’s go-to people, but a writer who didn’t hold the same viewpoint on super heroes that I had, and who would routinely have the most absurd status-quo-changing events happen, only to restore things (or not!0 by the end of a single issue. Haney never let characterization get in the way of what he wanted to do either, the result of which being that both Superman and Batman could be counted on to become total egomaniacal assholes if that’s what it took to keep the plot-gears turning. There are readers of today who complain that super heroes have become self-interested jerks, and that’s fair; what these comic books do is point out that that’s hardly a new phenomenon. Te story open with Superman and Batman stopping a would-be sniper from firing into a crown. 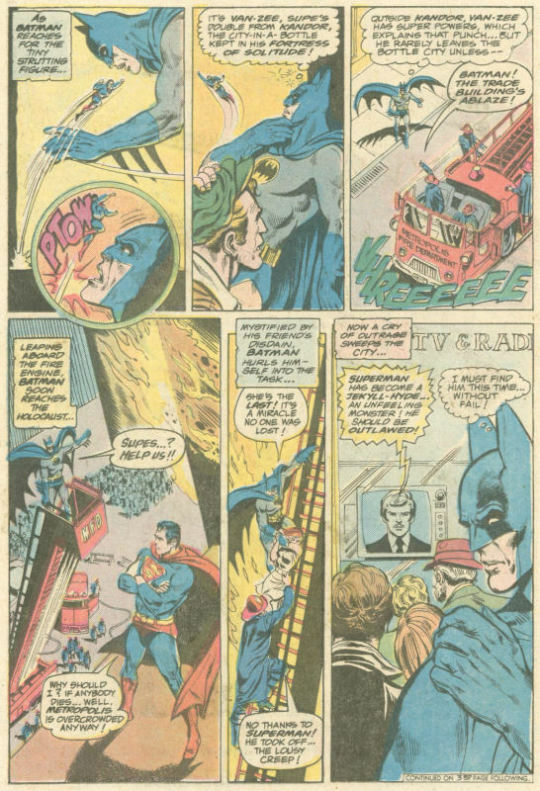 Superman drops a huge antenna on him, just about killing the guy. Batman is concerned about Superman’s (or “Supes”, as he continually calls him throughout his story) behavior but can do nothing about it. In the coming days, Superman continues to exercise excessive force and to be indifferent to the suffering of others. Seeking Clark Kent out at WGBS, Batman learns that he vanished several days ago, a sign that Superman has abandoned his dual identity. What is behind this? Among a sidewalk-seller’s stock of Superman wind-up toys that he can no longer sell, Batman discovers a tiny Superman, who swiftly jets away. This gives him the clue he needs, and he races to the Fortress of Solitude. Manufacturing a makeshift key out of ice, he opens the Fortress, and stopping long enough to return an escaped alien cat to its pen in Superman’s interplanetary zoo, he shrinks himself down and enters the Bottled City of Kandor, having correctly deduced that the tiny Superman figure was Van-Zee, Superman’s doppelganger from Kandor. In Kandor, Batman gets the disbelief-straining truth: Kandor had been facing civil unrest, such that Superman came to help them. He took the throne, becoming King Superman, and helped to restore order and tranquility. But ever since this began, a Jekyll/Hyde transformation has taken over Superman, and every time he leaves Kandor he becomes aggressive, uncaring, power-mad. 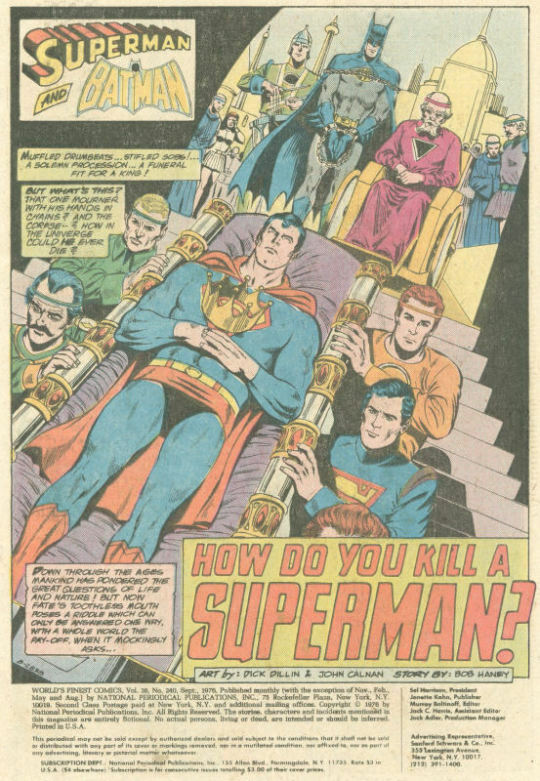 Batman agrees to try to get to teh bottom of things if the Kandorians will prevent Superman from leaving Kandor, so they chain Superman to his throne (crown and all). Returning to normal size, Batman discovers hat the pesky Zirkonian Cat has slipped its cage once more, and again pens him up. But Superman gets out once more and wrecks havoc across the world. 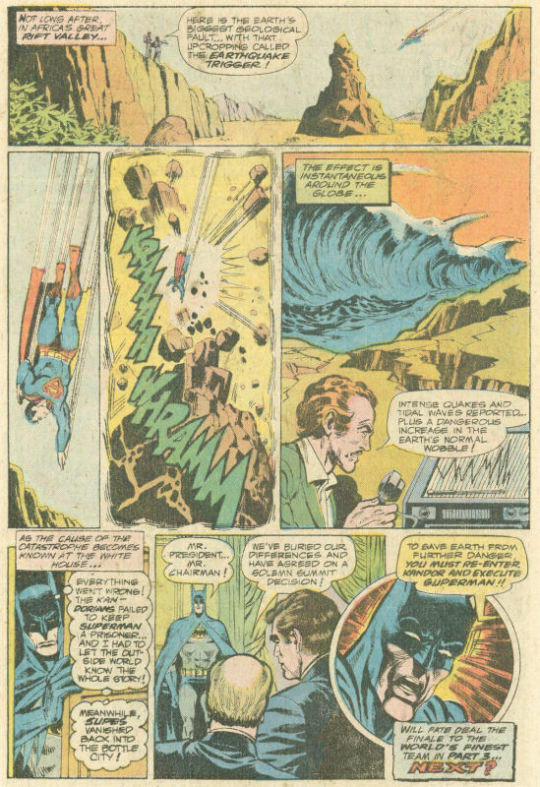 The President orders Batman to return to Kandor and assassinate Superman for the good of the planet, a task the manhunter takes on regretfully. But the Fortress defenses have been mobilized against Batman, so he must run the gauntlet to get to Superman. He ultimately fails, betrayed by a Superman Robot that he’d reprogrammed to sneak him in. But he’s still got one move. 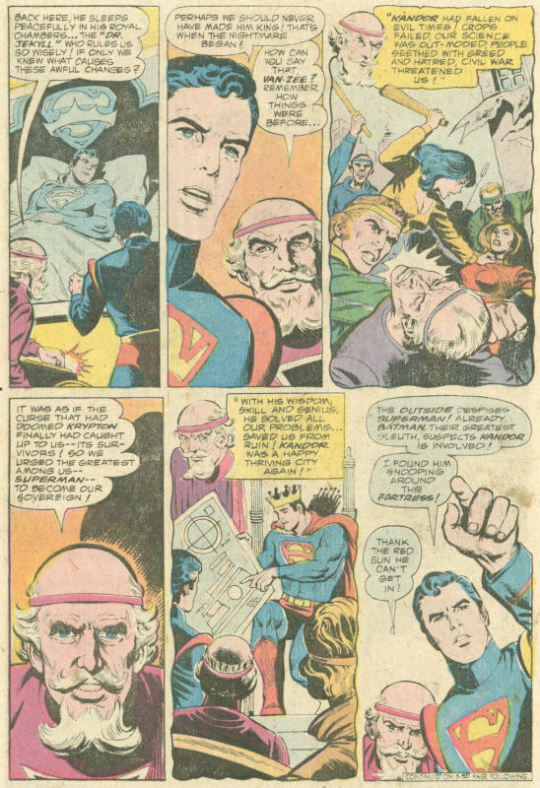 He tricks Superman into shaking hands with him and poisons the Man of Steel with a concealed needle in his palm. As Superman’s body is paraded in state to be buried, it suddenly grows to normal size, shattering its way out of Kandor while somehow not pulverizing the city or any of its citizens. Then the true, if obvious, villain is revealed: the Zirkonian Cat. 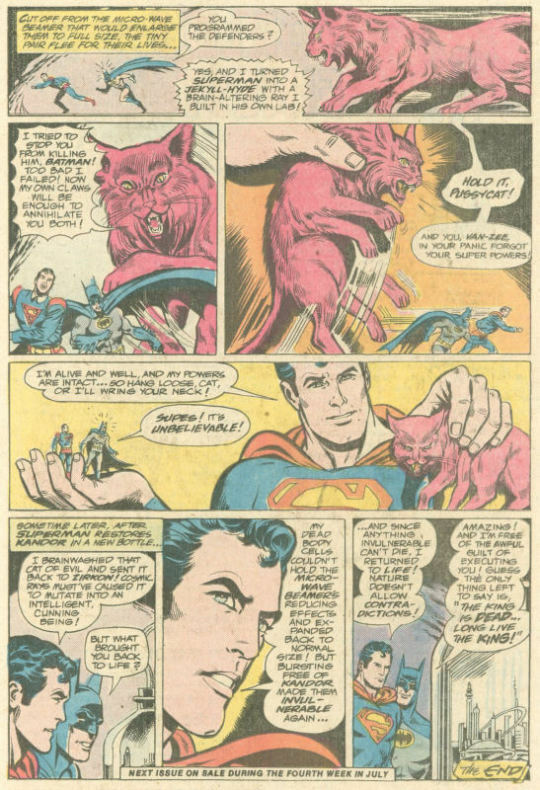 See, it’s a telepathic cat, and has used its powers to drive Superman to extremes. Now it intends to chow down on the still-miniaturized Batman and Van-Zee. But it’s stopped at the last second by a miraculously-alive Superman, whose powers returned when he grew and were enough to somehow bring him back to life in the biggest stretch in a story filled with ridiculous stretches. Everything wraps up in a few panels despite the fact that events happened in this story that would have radically changed everything going forward: Superman as the King of Kandor! Batman the killer! And so forth. But such was the way of a Boltinoff book–by the next issue it would be as though none of these events ever took place.